My March 2015 Market Report Is Available Now! My March 2015 market report is available now! This issue has my Eastham year end 2014 market report (part 2) which has the results for Eastham's neighboring Outer Cape towns. This newsletter provides the details of the recently announced Outer Cape natural gas moratorium. Additionally, there is a new listing - a brand new (2015) 3 bedroom contemporary Cape. This newsletter has been published every month for 12 years. My aim, with this newsletter, is to provide accurate sales and market information about the Eastham housing marketplace, to add commentary and opinion (as appropriate), and to keep it interesting. Download your copy of my March newsletter now. 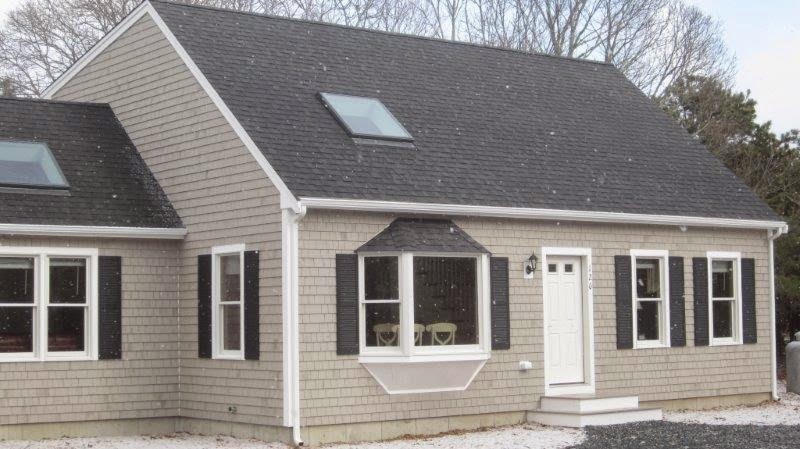 EASTHAM - A brand new (2015) 3 bedroom contemporary Cape with the finest features and finishes. There are 3 bedrooms, including a wonderful first floor master suite with master bath, a half bath with washer/dryer, and a granite and stainless kitchen. The open floor plan has a living room with vaulted ceiling, bay window, hardwood floors and a dining area with sliders to a Trex deck. There is a family room with a vaulted ceiling and a gas fireplace. Additionally, we have a 2 car attached garage, central A/C, outdoor shower, skylights, Azek trim, and exceptional interior trim. Just a short walk to Campground Beach. Listed at $674,000. Come see! For lots (and lots) of photos, go to http://120WagonwheelRd.robertsheldon.com. Also, a Virtual Tour can be found ... Here. Are We About To Dodge A Weather Bullet? 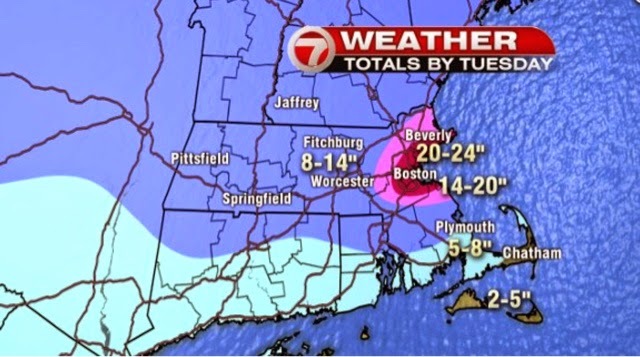 The weather for the next few days looks awful, especially for the Boston metropolitan area and western Massachusetts. It appears that the Cape, and the Outer Cape in particular, will be spared the worst of the upcoming storm, which appears to be ready to dump a foot or more of fresh snow, on top of the several feet already on the ground. Ugh! Check out the weather map, below, on what is expected. Note that the Cape is largely spared. It wasn't long before the new owners of the Truro Vineyards extended their brand with custom spiced rum. Their new rum, available as a spiced rum and as an amber rum, is called Twenty Boat, named to honor a legend of local rum-runners who outran the law during the prohibition. 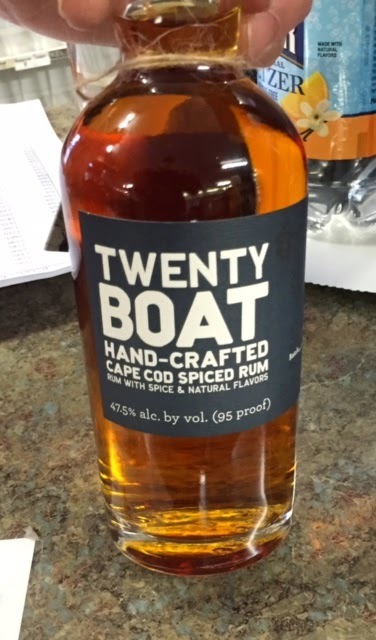 Currently the Twenty Boat rums are only available at a few stores (in Eastham at the Superette) and taverns (eg the Local Break) and only ship-able to addresses in Massachusetts. Check out the article in the Cape Codder. By now the ugly truth that National Grid, our local natural gas company, has problems with their gas delivery infrastructure has sunk in. 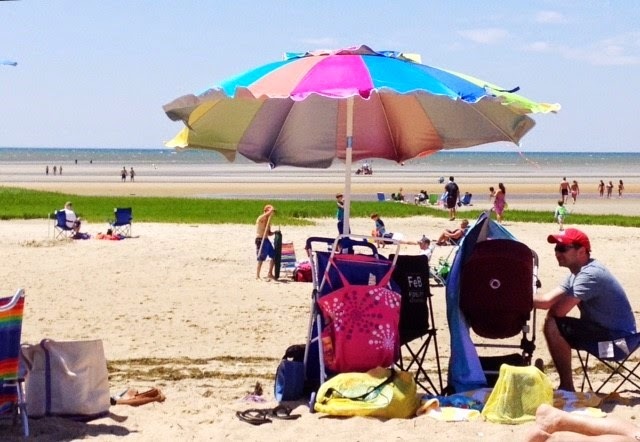 The company has placed a moratorium on new Outer Cape hookups, which is seriously inhibiting new construction. The National Grid has released a set of FAQs (frequently asked questions) that detail the rules by which they will grant permission for new hookups. New residential and commercial and industrial customer gas service connections are prohibited. Incremental gas load on existing commercial and industrial customer gas accounts is prohibited. This includes, but is not limited to, heating, hot water, cooking and other types of loads. 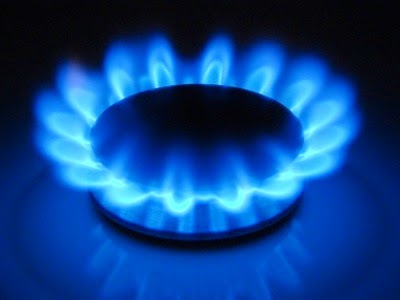 Incremental gas load on existing residential customer gas accounts is prohibited. This includes, but is not limited to, heating, hot water, cooking and other types of loads, unless it meets one of the exceptions below. For existing residential gas customers only, natural gas barbecues are permitted as added load. For existing residential gas customers only, emergency backup natural gas generators are permitted as added load, subject to application, review and approval of the Company. Please contact Kerrie Doyle at (781) 907-2201 for questions regarding the availability of service to new natural gas generators. 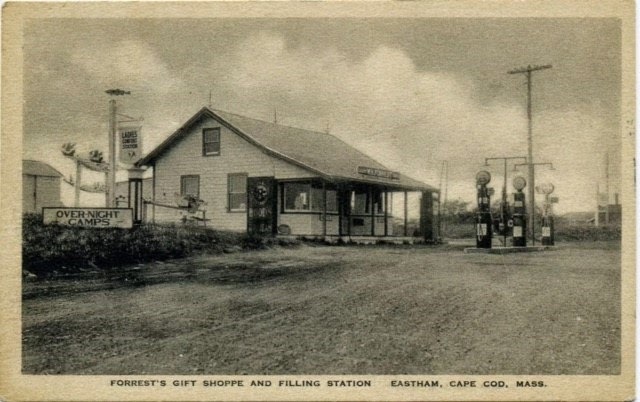 I was kicking around the internet and came upon an antique post card of Forrest's Gift Shoppe and Filling Station. Where is this filling station today? Does it exist (in an updated form) along Route 6 today? (Click on the post card to make it bigger). Eastham January 2015 Sales - REALLY Slow! 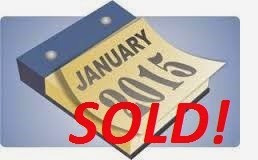 There was only 1 home sold in Eastham in January. The median sale (and average) price in January was $350K. There are currently 98 active single family listings in Eastham, with an average list price of $524K and a medium price of $450K. The average days-on-market is currently 254 days.